In the 1996 National Electrical Code the title of Article 645 was changed from Computer/Data Processing Equipment to Information Technology Equipment (ITE). This change reflects the fact that computer rooms are more than just for housing computers. In many cases they are the heartbeat of organizations. They serve multiple functions such as data processing, telecommunications, and data storage. The primary function of the computer room is still to house the information technology equipment, the computers. This article will look at the requirements in the National Electrical Code relative to information technology equipment and the correct use of Article 645. The Code, in review, is arranged into nine chapters and an introduction. Section 90-3 states that the rules in chapters 1 through 4 apply generally, and chapters 5, 6, and 7 apply to special occupancies, special equipment, or other special conditions—modifying or amending the general rules in chapters 1 through 4. Chapters 1 through 4 apply to all installations except as amended by chapters 5, 6, and 7 for the particular conditions. Chapter 8 of the NEC is independent of all other chapters unless referenced therein. What qualifies as an Information Technology Equipment (ITE) room? Section 645-2 sets the stage for whether or not the rules in Article 645 may be used for a computer room, or if the room and all electrical equipment associated with it must follow the requirements of chapters 1 through 4 of the Code. A close look at Article 645 reveals that several things must be considered. Article 645 offers alternatives to the some of the requirements of chapters 1 through 4, but several items must be in place to qualify for their application. Section 645-2 specifically states that Article 645 is applicable if “all of the following conditions” exist. This statement makes it clear that unless all of the items in Section 645-2 are complied with, Article 645 is not permitted to be used and the basic chapters 1 through 4 are the applicable rules for the installation. Six items must be in place before the computer room is permitted to be wired in accordance with the rest of Article 645. The first requirement in Section 645-2(a) is that a disconnecting means complying with Section 645-10 be provided. Section 645-10 requires a means be provided for disconnecting all electronic equipment in the information technology room. 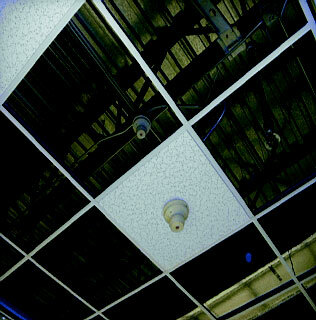 The HVAC system dedicated to serving the room must also be provided with a means of disconnect and any required fire/smoke dampers must close when this disconnect is thrown to the off position. 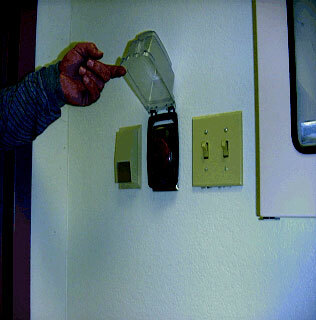 The control for these disconnecting means is required to be grouped, identified, and readily accessible at the principle exits of the room. A single means that will disconnect both simultaneously shall be permitted. 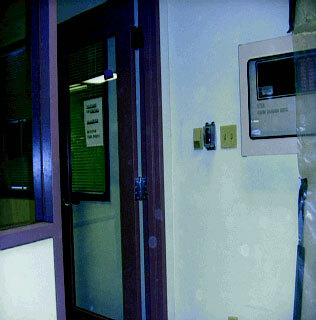 A mushroom-type button, often called a panic button, is usually installed at the principle exit doors of the computer room (see photo 1a, photo 1b, and photo 1c). The button usually is connected to a control circuit to actuate a shunt trip device for simultaneous disconnection of these loads. Any uninterruptible power supply (UPS) systems installed in the information technology room are also required to comply with the disconnecting means requirements of Article 645-10. 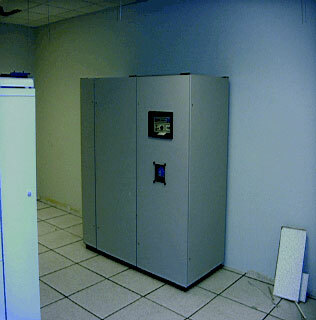 The second requirement in Section 645-2(b) is that a dedicated HVAC system be provided specifically for the information technology equipment (see photo 2). Any such HVAC system that serves other occupancies shall be permitted to also serve the information technology equipment room if fire/smoke dampers are provided at the point of penetration of the room boundary (see photo 3). 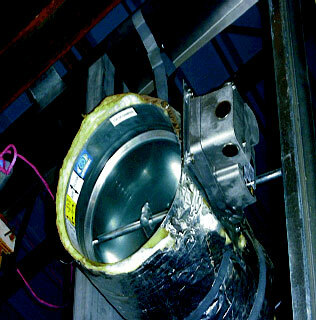 These dampers are required to close upon operation of the disconnecting means installed to comply with Section 645-10 and upon activation of smoke detectors in the room (see photo 4). The third requirement in Section 645-2(c) is that listed information technology equipment is installed. This equipment often bears a label that indicates suitability for use in an information technology room that meets the requirements of Article 645 of the NEC. Equipment that is marked in this manner must only be installed and operated in rooms that are set up in accordance with Section 645-2. The fourth requirement in Section 645-2(d) is that the only personnel occupying the room are those needed for the functional operation and maintenance of the installed information technology equipment. The fifth requirement in Section 645-2(e) is that the room is separated from other occupancies by fire-resistant/fire-rated walls, floors, and ceilings with protected openings (see photo 5). The minimum fire rating for an information technology room shall be 1-hour. This fire rating is not stated directly in Article 645, but four fine print notes (FPN) refer to NFPA 75, Standard for Protection for Electronic Computer/Data Processing Equipment, which requires the minimum 1-hour fire rating. The sixth requirement in Section 645-2(f) is that building construction, rooms, or areas and occupancy comply with the applicable building code. With all of these requirements in Section 645-2 complied with, the wiring for the information technology equipment room shall be permitted to follow the rules in Article 645 that amend the basic requirements of chapters 1 through 4. Remember that unless specifically amended by Article 645, all of the requirements in chapters 1 through 4 are still applicable. This is often a point of confusion in the design of a computer room or information technology room. Sometimes a building design will call for a raised floor assembly in the computer room for a convenient way to interconnect the computers. This method is allowed and the installation is clean in appearance when completed. Problems start when the raised floor is set up to be used as a space for transporting the air-conditioning for the equipment and the room. Remember, if the room or space is not constructed to meet the minimum requirements of Section 645-2 then it would be required to comply with the requirements for wiring installed in spaces used for air handling purposes. In that case, all of the installed wiring and cabling, etc., would need to meet the requirements of Section 300-22. Section 645-5 sets up requirements for the branch-circuit conductors, connecting cables, interconnecting cables, and the guidelines for the area under raised floors. The branch-circuit conductors are required to have an ampacity of not less than 125 percent of the total connected loads. These are continuous loads most of the time. In Section 645-5(b) “the data processing equipment is permitted to be connected by any of the following three methods listed for the purpose (see photo 6). (3) Cord set assemblies. If run on the surface of a floor, they are to be protected from physical damage. “Separate data processing units are permitted to be interconnected by means of cables and cable assemblies listed for the purpose. They also must be protected from physical damage where run on the surface of the floor. “Power cables, interconnecting cables, connecting cables, and receptacles associated within the information technology equipment shall be permitted under a raised floor under the following conditions. (1) The floor is of suitable construction and is accessible. (2) Branch circuit supply conductors to receptacles or field-wired equipment are installed in rigid metal conduit, rigid nonmetallic conduit, intermediate metal conduit, electrical metallic tubing, metal wireways, surface metal raceways with metal covers, flexible metal conduit, liquidtight flexible metal or nonmetallic conduit, MI cable, MC cable, or AC cable assemblies. These wiring methods must be installed to meet the securing and supporting requirements specified in Section 300-11. 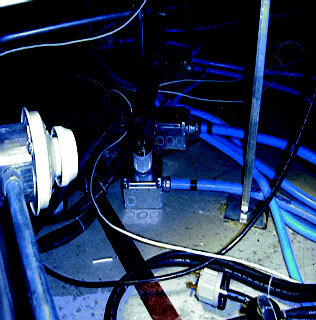 (3) The ventilation in the under-floor area is for the information technology equipment only. 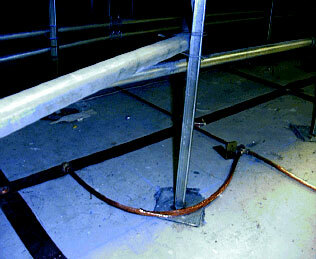 (4) Openings are such that the cables and cords passing through them are protected from abrasion, and are of a design that minimizes debris from accumulating beneath the raised floor (see photo 6a). “Power cables, communication cables, interconnecting cables and associated boxes, connectors, plugs, and receptacles that are listed as part of the information technology equipment shall not be required to be secured in place” 3 (see photo 8 through 8b). This allows flexibility for expansion and reconfiguring of the computer room. This is one area where relief from the basic support and securing requirements of chapter 3 is permitted. 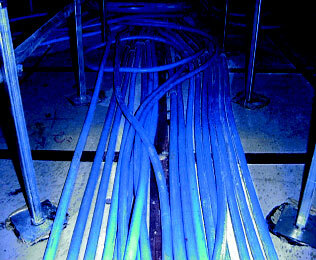 Any cables that extend beyond the information technology room are subject to all of the requirements in the code, even if they originate in the computer room. Any penetration of the fire-resistant room boundary must be have the appropriate fire seals at those penetrations in accordance with the rules in Section 300-21 (see photo 9 ). 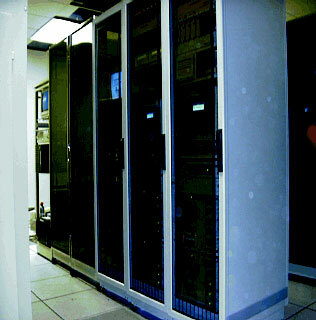 UPS systems can come in a variety of types and sizes, and are often utilized in information technology equipment rooms. UPS systems installed within the information technology room and any output circuits must comply with the disconnecting means rules in Section 645-10. This includes the output of battery UPS systems. The output of the batteries must also be disconnected from its load. There are some alternative requirements for integrated electrical systems installation in accordance with Article 685. This would allow means of disconnect to be in the form of orderly shut down to ensure safe operation. Specific conditions outlined in Section 685-1(1)(2) and (3) must be complied with. This is a case where the rules of Article 645 are further modified by a later article in chapter 6 (Article 685), if certain rules are complied with. Small UPS unit equipment capable of supplying loads of 750 VA or less are not required to be disconnected from the source if the requirements of Section 645-11 are met. 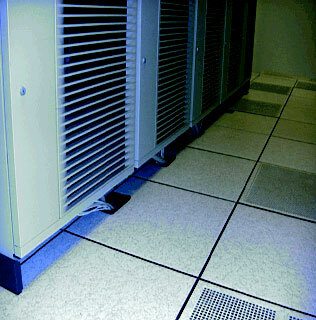 The grounding requirements for information technology equipment rooms are found in Section 645-15. “All exposed noncurrent-carrying metals parts of an information technology system shall be grounded in accordance with Article 250 or shall be double insulated. 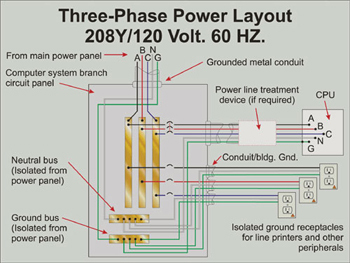 Power systems derived within listed information technology equipment that supply information technology systems through receptacles or cable assemblies supplied as part of the equipment shall not be considered separately derived for the purpose of applying Section 250-20(d)” (see photo 12). Some alternative requirements are here also, but remember the first sentence of Section 645-15. The power distribution unit (PDU) may contain a separately derived system and even a line conditioner, but may not be required to have a grounding electrode conductor run to the electrode system of the structure. 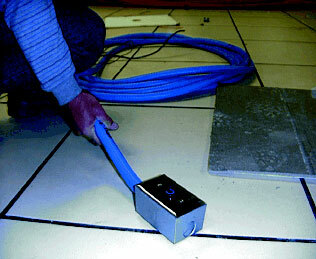 Equipment grounding conductors are always required on the primary and secondary sides of such PDUs. Installation instructions and wiring diagrams supplied with the PDU are key at this point in the inspection or installation. Bonding and grounding requirements in the product standards governing this type of listed equipment or systems ensure that the requirements of Article 250 are met. Isolated grounding type receptacles must comply with the requirements of Sections 250-146(d), 384-20 Exception, and 410-56(c) [see figure 11]. The earth shall not be used as an equipment grounding conductor. These isolated equipment grounding conductors are permitted to pass through one or more panelboards so as to terminate at the system grounding point, either at the source of a separately derived system or at the service (see figure 12). Remember, these equipment grounding conductors are required to be installed in the same raceway, cable or trench as the ungrounded (hot) conductors and the grounded (usually the neutral) conductors of the circuit [see Sections 250-134(b)]. 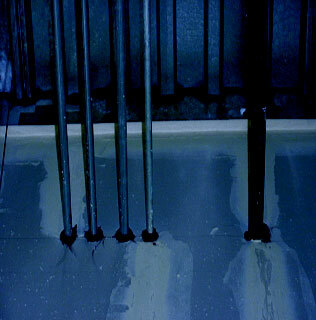 Supplemental grounding electrodes are permitted for information technology equipment and equipment rooms, but they must be bonded to the building grounding electrode system. 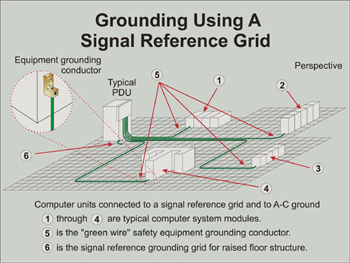 Signal reference grids are often installed in information technology equipment rooms. This is a method of keeping the shields of cables and chassis (frames) of information technology equipment at the same zero potential as the derived system (see figure 13 figure 14, figure 15, and figure 16). 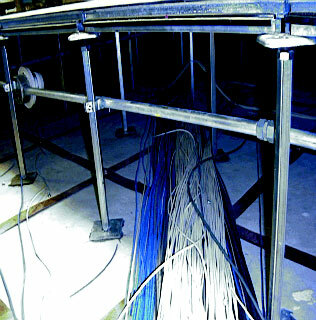 These signal reference grids, usually installed under the raised floor in the information technology room (see photo 13), must be bonded to the equipment grounding system provided for the information technology equipment. 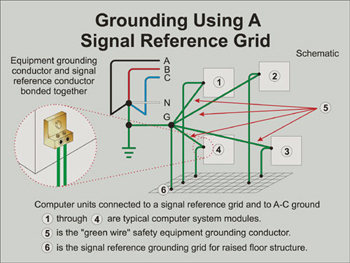 This simply means there will be two grounding conductor connections at the equipment: the required equipment grounding conductor, and the supplemental reference grounding conductor. Sometimes there might even be a third grounding conductor connected to a supplemental grounding electrode. The important point here is that the safety equipment grounding conductor always remains connected. 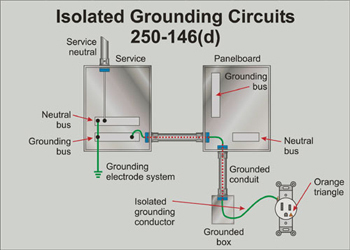 Isolated grounding conductors and systems do not mean isolated from connection to the grounding point of the supply system or service. This is extremely important for personnel safety, which has to come first. Information technology equipment is required to be marked with a manufacturer’s nameplate which shall include the input power requirements for voltage, frequency, and maximum rated load amperes. This information technology equipment is usually listed by a qualified electrical testing laboratory, and will bear the appropriate listing markings. Listed equipment is required to be installed and used in accordance with any instructions included in the listing or labeling [see Section 110-3(b) of the NEC]. The NEC has a specific article designated for information technology equipment and covers the requirements of information technology equipment rooms. There are some alternatives to the requirements of the basic rules in chapters 1 through 4 of the Code, if Article 645 is adhered to. Equal and effective safety is maintained if all of the conditions specified in Section 645-2 are met. As previously noted, unless modified or amended by the requirements of Article 645, the rules in Chapters 1 through 4 must be followed. We hope that this writing will assist readers in understanding these basic requirements and clarify the rules for information technology equipment and ITE rooms. NFPA Standard 75, The Standard for Computer/Data Processing Equipment, contains other details and information regarding information technology equipment and rooms. As always, one should consult the local authority having jurisdiction to ensure compliance with the NEC and any local amendments or ordinances. 1 National Electrical Code, NFPA 70-1998 (Quincy, MA: National Fire Protection Association, 1998) Article 645-1, Scope, p. 70-463. 2 National Electrical Code, NFPA 70-1998 (Quincy, MA: National Fire Protection Association, 1998) Article 645-5(b) through 645(5)(c), p. 70-463-464. 3 National Electrical Code, NFPA 70-1998 (Quincy, MA: National Fire Protection Association, 1998) Article 645-5(e), p. 70-464. Has UL Certified any small wind turbines?